Posted on Wednesday, March 19th, 2014 at 9:40 pm. For all those that are sounding the trumpets of boxing’s impending death or already demise, the first three weekends of March have proven them unequivocally wrong. Boxing has come back in full force after a month long hiatus due to the Winter Olympics held in Sochi, Russia. As a general rule the boxing world or better said the networks that rule the boxing world, go dark during the Olympics and the FIFA World Cup since they don’t want to compete with such traditional attention grabbers. For the most part during the summer boxing slows down to a snail’s pace since HBO and Showtime figure people are out enjoying the sun or vacations in the western hemisphere, their biggest market. First up on the docket was the rematch between the “son of the legend” Julio Cesar Chavez Jr and unheralded Brian Vera on March 1st on HBO. 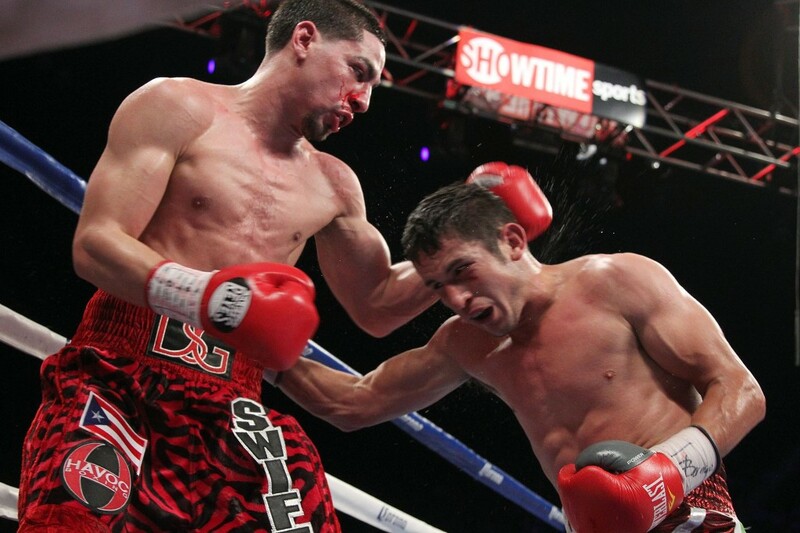 The twelve-round special attraction bout from San Antonio, Texas, drew nearly 1.4M viewers according to Nielsen Media Research. The semi-main event between veteran Orlando Salido and rookie Vasyl Lomachenko was watched by over a million subscribers in itself with the Chavez Jr II-Vera peaking at 1.5M. Next up was Mexican red-headed super star Saul “Canelo” Alvarez. The twenty-three year old ex-champ was in the first time on the “A” side of a major PPV when he faced former interim champion Alfredo “Perro” Angulo. Looks that despite putting in one of the worst performances by any opponent against Floyd Mayweather Jr, “Canelo” Alvarez retained some of his fan base since more than 350,000 orders were made of the Pay-Per-View event. Not nearly the over two-million buys that Mayweather Jr-Alvarez generated but “Canelo” proved that he is a respectable PPV attraction and with the right fights, perhaps a future PPV star. Alvarez is slated to return on July 26th, no word if it will be on PPV but based on his recent numbers, more than likely it will. This past Saturday night from Bayamon, Puerto Rico, WBC/WBA light welterweight Danny Garcia tried to capture the minds and souls of the rabidly loyal Boricua fan base but perhaps came up quite short when he squeaked by the determined Mauricio Herrera with a majority decision. Despite of his flat performance in front of a sold-out Ruben Rodriguez Coliseum, the event was watched by a peak audience 1.1 million viewers on Showtime. The bout generated an average 972k viewers with the one round semi-main event between knockout artist Deontay Wilder and Malik Scott was also part of the telecast. A replay of the aforementioned Alvarez-Angulo bout was also on. Nearly three million viewers watched boxing broadcast in the United States in the last three weeks and that goes without saying what was shown in Mexico, the UK and in others parts of the world where major fights were also fought. IS THERE A FIGHT THIS SATURDAY NIGHT? Let us all wait & see this coming April, our very own Pacman to show his ware against the Desert Storm…soon!!! Mayweather vs. Alvarez: Canelo weighs in at 166.8 lbs. Will Alvarez and Company Take Risk? Can Canelo handle Floyd Mayweather’s Offensive skills? WHAT ARE THEY SELLING US?